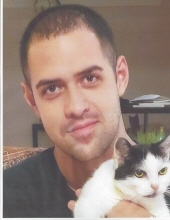 Paul Andres Youman, 29, died Wednesday, March 27, 2019. Born in Ecuador, he was raised in Kearny and has lived in North Arlington for the past 10 years. He worked as a bartender / server at Casual Habana Café in Hackensack for the past year. He proudly served in the United States Navy from 2008 to 2012. He was the beloved son of Maria Elena Youman and Artrus Youman; and the cherished grandson of Katherine Youman. Relatives and friends are invited to attend the Funeral from the Parow Funeral Home 185 Ridge Rd., North Arlington on Monday, April 1st at 8:45 a.m. thence to Our Lady Queen of Peace Church, North Arlington for the Funeral Mass at 9:45 A.M. Cremation Private. Visitation will be held at the Funeral Home on Sunday, March 31st from 4-8 p.m.
To send flowers or a remembrance gift to the family of Paul Andres Youman, please visit our Tribute Store. "Email Address" would like to share the life celebration of Paul Andres Youman. Click on the "link" to go to share a favorite memory or leave a condolence message for the family.